One of the most dangerous things about sustaining a burn is that there is a lack of skin barrier to protect the body against pathogens. In addition, if there is dead tissue, bacteria tend to feed off that tissue, leading to infection. Large burns tend to negatively impact the burn victim’s immunity, making systemic infection more likely. The best practice around the treatment of burns includes strict antiseptic technique, particularly using sterile gloves when handling the burned area, using facemasks in burn centers and cleaning off as much dead tissue as possible. All equipment used in a burn center, including blood pressure cuffs, IV equipment and dressing supplies, should be as clean or even sterilized when possible. After the patient has left the hospital, staff should come in and should clean the floor, walls, ceiling, and all other surfaces. 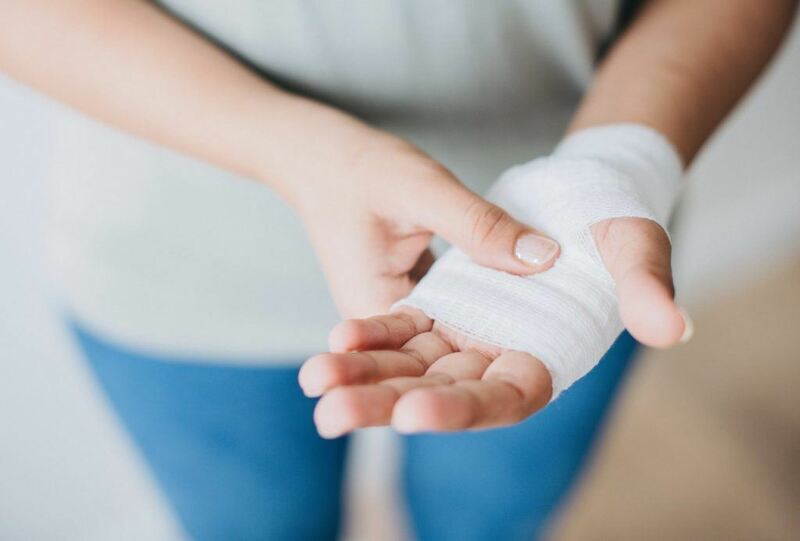 What this means is that the best way to manage wound infections in patients with burns is to prevent them from occurring in the first place. Ideally, patients in a burn unit should reside in individual positive pressure rooms that keep bacteria out and should have the space filtered with a reputable Hepa air filter. Cleaning and sterilizing should be scrupulous. What is a burn infection like?When a burn happens, the bacteria in those areas of the burn that have been destroyed by heat or chemicals also die off. Even so, there are areas in the periphery of the wound or in the surrounding skin that still contain viable bacteria that can infect the burn. A single bacterium can multiply into a total of ten billion bacteria in just one 24 hour period of time. The bacteria are relatively protected from injury in sebaceous glands and hair follicles in the dermis of the skin so these are the bacteria that spill out and contaminate the wound. Burns that are deep have tissue that is not well supplied by blood vessels, which can carry anti-bacterial cells of the immune system, so that bacteria can survive unchecked. If the bacteria are dangerous enough, they can infiltrate healthy tissue and can cause a true “wound infection” with the possibility of systemic complications. Burns usually have redness around them, which doesn’t necessarily mean it is infected. Even the presence of a fever doesn’t indicate infection as the burn itself can trigger mechanisms that cause an elevation in body temperature. The redness around the burn is usually indicative of the presence of inflammatory molecules and cells that are drawn toward the burn in the healing process. This type of burn redness goes away by post burn day 5-6. The difference between this type of process and a burn infection is that the inflammatory process rarely hurts. Burn Wound ColonizationWhen bacteria are found on the surface of a burn but not in great concentrations, this is called “burn wound colonization”. There is no invasive infection and it is not usually painful. The doctors treat this kind of thing with local cleaning of the wound, the application of topical anti-bacterial agents, and surgery to further debride the wound. (Debriding involves physically removing dead and infected tissue). If the counts of bacteria continue to rise, they will often change the anti-microbial agent to cover for the bacteria present. When the burn is colonized greatly, it is called a “burn infection”. The healthy tissue is also infected and the margin of redness around the burned area becomes greater. The patient usually gets a fever and the wound is more infected. This is treated by using topical and systemic (oral or IV) antibiotics as well as by putting on topical anti-bacterial cream or ointment. One complication of a burn is called toxic shock syndrome. It is a serious type of soft tissue infection from Staphylococcus aureus that produces TSS-toxin-1. It usually occurs with small wounds and is often found in children. The patient has severe systemic symptoms such as fever, nausea, diarrhea, vomiting and malaise. There is often a rash associated with toxic shock syndrome. It occurs usually in burns 2-4 days old and carries with it the threat of shock and a mortality rate of up to 50 percent. It needs aggressive treatment with life support and systemic antibiotics, usually against methicillin-resistant Staphylococcus aureus (MRSA) unless a different type of bacterium is cultured. odor. The important factor in clearing these wounds is to get rid of every bit of dead tissue possible through surgery. Serious Burn InfectionsWith the emergence of bacteria that are resistant to many antibiotics, there has been an increase in serious burn infections that are difficult to treat. One such bacterial type is Pseudomonas species, which causes clogging of the blood vessels around the wound, an increase in dead tissue and sometimes death. When a wound is infected this way, it is called ecthyma gangrenosa and looks like a blue to black spot in the center of the burn. Enterococcus species have also become drug-resistant. A fungal organism called Fusarium can invade healthy tissue and turn it necrotic (dead). It has the unfortunate problem of being amphotericin resistant. Treatment must be as aggressive as this organism, using other anti-fungal agents, topical anti-fungal creams and aggressive removal of necrotic tissue. Even Candida (a type of fungus) can cause burn infections. Doctors can check serum Candida antibody titers to see if the infection is developing and can save the person’s life if it is caught early. They can also detect Candida in the urine even if the start of the infection was on the skin. A Candida infection and systemic candidiasis usually comes from having an immunocompromised patient and following aggressive antibiotic use. When this happens, Candida can be found just about everywhere inside the body. Death is associated with amphotericin-resistant Candida infections. Doctors can take biopsies of any part of a burn that appears to be changing to see under the microscope whether or not there is serious infection brewing. This can allow for early and aggressive management of the burn. Increasing counts of bacteria or yeast in the wound can indicate a need for a different anti-microbial cream or ointment for the burn. Viral infections can also contaminate wounds. Common viral infections in burn patient wounds include cytomegalovirus, herpes, and adenovirus infections. Cytomegalovirus can be particularly virulent and is associated with larger burns (greater than 50 percent of the total body surface area). Burn-associated InfectionsPatients with contaminated burns can get a bloodborne infection called sepsis. The patient will develop a fever or low body temperature, rapid heart rate, shortness of breath, high blood sugar, and low platelet counts. They have a hard time ingesting even liquid feedings and so this must be stopped until they can recover. Sometimes a particular organism is detected through cultures of the blood. Pneumonia can come out of burn infections. It is more common in patients who required mechanical ventilation as part of their treatment. The bacterial infection can happen because of an inhalation of bacteria into the lungs or from spread of wound bacteria to the lungs through the bloodstream. In about half the cases, the doctor can check the organisms growing in the wound for an exact match of the organism found in the lungs. Other infections that can stem out of burn wounds include abdominal infections, eye infections, chondritis of the ear cartilage, sinus infections, and urinary tract infections. The key to managing these dangerous bacteria remains surgical excision of dead tissue, identifying the organism and providing antibiotics by topical application and parenteral routes that can quickly get the infection under control.